A community can only be as strong as the bond of its people. If those bonds are weak, the community is easily divided, but the stronger they are, the more the community can work together. On Jan. 31 at the New Hong Kong Restaurant, the Women of Color Empowered Luncheon will bring together women who work tirelessly to unite their communities, women who are true bridge builders. Carmen is the CEO of The Aguiar Group, which she founded in Bellevue in 1993. Before starting her firm 17 years ago, Carmen worked in the tax department at Ernst & Young LLP in New York and Seattle. She has since grown The Aguiar Group into a nine-person, award-winning CPA firm offering tax, financial accounting, and consulting services to individuals, families, entrepreneurs, and small businesses in the Seattle area. Carmen also has a passion for governance, regularly serving on corporate, not-for-profit, and government boards. She has spent the past three years serving on the Board of Directors of Plaza Bank, a commercial bank serving the Latino community in Washington. Carmen is fluent in Spanish and earned a Bachelor of Arts in Accounting from Hunter College of The City University of New York. She is a member of the American Institute of Certified Public Accountants, National Association of Corporate Directors, and Bellevue Rotary. Debbie Bird was the community relations director for Safeco Insurance and Safeco Insurance Foundation. She worked to drive Safeco’s sponsorship programs, maximizing foundation and corporate exposure. Debbie was at the forefront of building the company’s brand through sponsorships that aligned with the foundation’s four focus areas: arts and culture, environment, economic inclusion, and youth empowerment. In 2008, City Year King County recognized her work, awarding her their prestigious Hooty Crittendend Award for bringing forth growth and creating positive change. Also in 2008, she was presented with the Community Leader of the Year award by the Greater Seattle Business Association for her advocacy work. She uses her incredible skill of bringing people together and her powerful gift of persuasion to connect those who have resources with those who need support. In 2008, the Tabor 100 presented Debbie with their prestigious Crystal Eagle Award for her outstanding community leadership, in the development of awareness and concern for minority andunder-privileged communities. Ellen Ferguson is a proud fourth generation Washingtonian. Raised in Bellevue, her parents instilled in her an appreciation for the entire community. She has enjoyed a 35-year-long career at the Burke Museum, currently working as the director of community relations. Her museum work has led to board service as president of the Ethnic Arts Council of the Seattle Art Museum and as a board co-chair of the Wing Luke Museum of the Asian Pacific American Experience. She also proudly carries the title of “Museum Lady” at Children’s Hospital, where she has shared artifacts with patients for the last three decades. Ellen has been fortunate to serve on numerous community boards, including the Empty Space Theater, Bailey Boushay House, Islandwood, and the Alaska Wilderness League. As a proud member of the University District Rotary Club, she has traveled throughout the world on Rotary Service Delegations, including wheel chair deliveries in Vietnam and providing polio vaccines in Ethiopia. Ellen’s base of operations is Madison Park, where she lives with Kumuda Kali, her partner of 27 years. After leaving a difficult marriage in 2006, Nikki found herself 3,000 miles away from family and living on the streets. She experienced being without basic necessities that every woman requires on a daily basis. She eventually moved to Seattle and got her life back on track, but she never forgot going through that period of her life. It was after their experience that she found Dignity for Divas, an organization focused on providing “daily hygiene” items to homeless women. Hygiene is the first step in regaining self worth and is vital to maintain a healthy and sound life. Dignity for Divas’ mission is to spark the inner diva in all homeless women in hopes of giving them dignity and a reminder of their true self. Yoshiko Harden currently serves as the vice president of diversity in the Office of Equity and Pluralism at Bellevue College. As vice president, she provides leadership in the development, coordination, and implementation of programs that promote and integrate equity and inclusion at the college. She was formerly the director of multicultural services and student development at Highline Community College. As an educator and practitioner, she believes that building human capacity to create institutional change is most successful when approached from both individual and institutional angles. Her overarching goal is to help create for students the college experience she always wanted but never received. Most recently, she co-developed a parents of color group at the Seattle Girls School, which her 11-year-old daughter, Leila, attends. The group provides support for parents of color to build community and better integrate into the “SGS” parent experience. For the past 17 years, Tina has served as the founding director of the Longhouse Education and Cultural Center at the Evergreen State College. She oversees all aspects of design, funding, development, and implementation of the Native American public service programs of the Longhouse, including the Native Economic Development Arts Program (NEDAP). She has also convened a wide variety of artists and arts organizations through various symposia and convenings, including the first gatherings of the Northwest Native American Basketweavers Association, the Northwest Native Woodcarvers, Northwest Native Arts Symposia, and convenings of arts service organizations on behalf of the Ford Foundation, in partnership with Leveraging Investments in Creativity (LINC). In 2011, Tina was invited to join the Aboriginal Program Council at the Banff Centre in Alberta, where she is currently advising on the creation of a new indigenous arts center at Banff. An adjunct member of the faculty at Evergreen, Tina currently serves as the Planning Unit Coordinator for all Native American academic and public service programs at the university. Vivian Lee is a retired nurse who developed and implemented policies that brought more Asian Americans and other people of color into the nursing profession. A proud Husky, graduating with a Bachelor’s of Science in Nursing in 1959, Lee is now a consultant in Women’s Health and Clinical Administration, reviewing federal grants and contracts for the DHHS and The Centers for Disease Control. She is also a community volunteer, focused on enhancing diversity and advancing public health. She has also worked with the U.S. Public Health Service, most recently serving as the founding director of the Office of Women’s Health, serving Washington, Oregon, Idaho, and Alaska. Pearl was born in Hong Kong and immigrated to the United States with her family at the age of 6. After graduating high school, she decided to attend the University of Washington without ever visiting Seattle. Three short years later, Pearl made lifelong friends and mentors while working on Governor Locke’s campaign, managing Representative Velma Veloria’s re-election campaign, and working with inner-city high school students at Upward Bound. Still passionate about her undergraduate work in American Ethnic Studies, Pearl sought a different path to impact change by obtaining a Masters in Urban Planning, eventually taking her skills to Harlem. Her path has led to her career at Vulcan, Inc., where Pearl revels in being a professional bridge builder. As the community relations manager, Pearl has been instrumental in working with diverse nonprofit organizations to advance their goals and mission. As a market development manager for CenturyLink, Jane Nishita’s focus is on the community. She serves as the eyes and ears for the company to the community and is the bridge between nonprofit organizations and the company. Jane also inspires employee volunteerism, inviting employees to volunteer with their favorite 501(c)3 so that CenturyLink can write a check to match their donated time. Jane has worked for CenturyLink for 33 years and is a graduate of the business schools of the University of Hawaii and the University of Washington. She is a Leadership Tomorrow Alum and lives in West Seattle. Washington Women In Need’s (WWIN) goal is to improve the lives of low-income women in Washington through financial assistance for health care and education. The organization strives to improve the quality of women’s lives by supporting their educational goals and improving the quality of their lives by helping them maintain or improve their physical and mental health. WWIN empowers women to improve the quality of their lives by treating them with dignity and respect in all their encounters with staff, volunteers, and board members. WWIN believes that by improving the lives of low-income women, they improve the lives of their families and the strength of our communities. 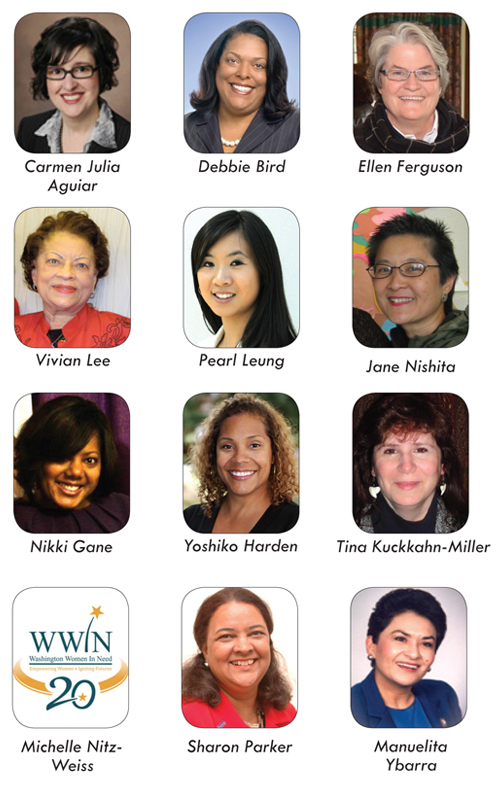 Since the organization’s founding in 1992, WWIN has provided financial assistance to over 5,000 low-income women via the vision and generosity of their founder, Julia Pritt, and the donations of individuals, businesses, corporations, foundations, and other service organizations. WWIN receives no federal or state government funding for its programs and charges no fee for services. Dr. Sharon Parker serves as the assistant chancellor for Equity and Diversity at the University of Washington Tacoma, where she is responsible for initiating and monitoring campus policies and practices that support an inclusive and respectful environment. Previously, Dr. Parker served as a visiting scholar at Claremont Graduate University in California, and a resource faculty at Evergreen State College in Olympia, while also maintaining a practice as a private consultant on diversity issues in higher education. She specializes in institutional transformation through diversity. From 1997 to 2000, she served as the president of the American Institute for Managing Diversity, Inc. (AIMD) in Atlanta, Ga., a position that drew upon her combined expertise in the nonprofit sector and career work on issues of diversity. Prior to joining AIMD, Dr. Parker served as the director of Social Responsibility Programs for The Union Institute, a national, progressive university, and senior associate provost and director of the Stanford University Office for Multicultural Development. In addition, she lectured publicly on the topics of multiracial, multi-ethnic, and multicultural communities, and institutional change. She was born in Washington, D.C. and is of Native American (Tslagi/Rappahanock/Susquehama) and African American heritage. Manuelita Ybarra is a program analyst for the Women’s Bureau, an agency of the U.S. Department of Labor, working in Seattle and serving the Northwest. She has been a driving force in coordinating many Department of Labor events that are initiative-driven work projects. She has orchestrated several projects affecting older workers, including the planning of the annual Resource Fairs for Mature Workers for four years. Her work on “Workplace Flexibility” is an ongoing effort to promote and improve business practices and policies that provide greater work-life balance and workplace flexibility. She is also focused on equal pay, green jobs, and non-traditional jobs in the trades and construction to help women become self-sufficient and transition to new careers. Ms. Ybarra has over 25 years of experience in workforce projects, as a manager, and as an analyst adhering to complex laws, contracts, grants, and regulations monitoring and reporting on government programs. She has worked in adjudicating Foreign Labor and Unemployment Insurance Programs. She is experienced in labor relations, facilitating committees, planning meetings, conferences, and coordinating educational events and seminars. She has a proven track record and a successful career in coordinating meetings with businesses, public/private sectors, and works with chambers, employers, and profit/non-profit agencies in local communities. The event will be hosted by Natasha Burrowes. you’ll never go back to traditional dating again! walk across the street clutching a paper cup packed with scalding liquid. Here, amplifier has a function to handle the efficient power of your speaker driver. should be in order to obtain optimum sound. sure that service continues for a longer period of time. In front of those three restaurants is a csaaul place called The Cove, which serves dishes inspired by the threefine dining restaurants. online casino Disclosure: I have no positionsin any stocks mentioned, but may initiate a long position in PNK over the next 72 hours.